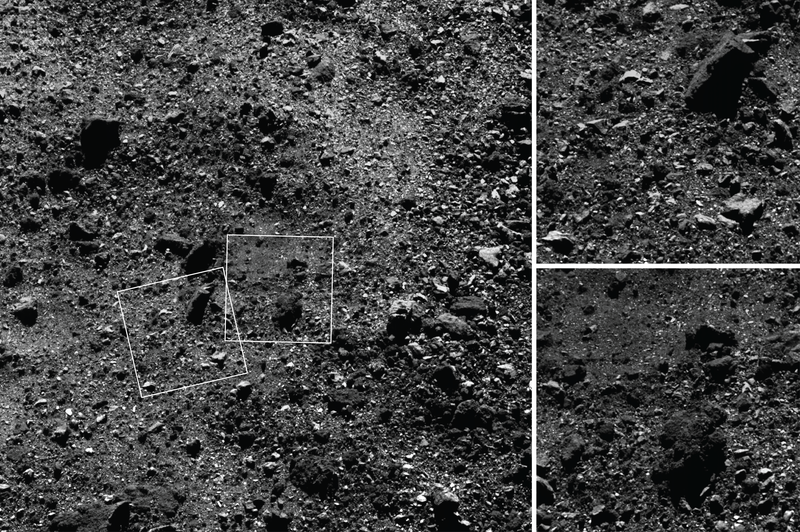 Enlarge / These images of the asteroid Bennu’s northern hemisphere show it covered with rocks. After traveling more than 2 million kilometers through outer space over the course of 27 months, NASA’s OSIRIS-REx spacecraft arrived at the asteroid Bennu in early December of last year. Since arriving, the spacecraft’s five scientific instruments have been surveying the 490-meter wide asteroid to better understand its properties and find a safe landing site from which to gather samples for a return to Earth. On Tuesday, the first results of these scientific inquiries were published in seven papers that appeared in Nature and a handful of its research journals. The seven papers are collated on this website. In some respects, Bennu is about what scientists expected—a “rubble pile” of stony meteorites that have aggregated under the influence of microgravity. Scientists were able to determine that the density of the asteroid is about 1,190kg per cubic meter. By way of comparison, a potato has a density of about 700kg per cubic meter, and dry gravel about 1,500kg per cubic meter. With an average albedo of 4.4 percent, this asteroid is one of the darkest objects in the Solar System. What surprised scientists, however, is the overall diversity of the albedo, or reflectivity of Bennu’s surface. The albedo ranges from the extremely dark—like freshly poured asphalt, at 3.3 percent—up to nearly 15 percent. In one of the research papers, mission scientists expressed concern that the unexpected variance of Bennu’s albedo may confound the spacecraft’s lidar guidance system as it approaches the asteroid to gather a sample. Another potential problem, in terms of finding a safe site to sample Bennu’s regolith, is the preponderance of boulders on the surface. So far, the scientific team has identified more than 200 boulders at least 10 meters across and mapped more than 3,000 down to 1 meter in diameter. Prior to the spacecraft’s arrival, scientists had expected Bennu’s surface to be relatively smooth and designed the probe’s “touch-and-go” sampling device for such conditions. There are other mysteries as well. Due to the detection of particles in the vicinity of Bennu, scientists think the asteroid must be periodically erupting material from its surface, but it’s not clear how this is happening, or why. The mission scientists say this “unexpected phenomenon” remains under investigation and that they will fully investigate the matter before committing OSIRIS-REx to descend to the surface for sampling operations. Fortunately, the mission planners left a lot of time for just such studies as the sampling maneuver will not occur until July 2020. Until then, OSIRIS-REx will study the asteroid in greater detail—mapping the topology of the space rock to a greater resolution than even the Earth’s surface. The map of Bennu will have on the order of 5cm spatial and a few cm vertical resolution. This should help NASA resolve some of the scientific mysteries raised by initial observations and find a safe sampling site.